Abstract: The sensory attributes of edible oils: aroma, color, and stability of the physicochemical properties are important factors in determining market value. The structural changes in the composition and variations derived from the reuse of oils, after prolonged excess heat, are the origin of toxic products of oxidative degradation of the same. 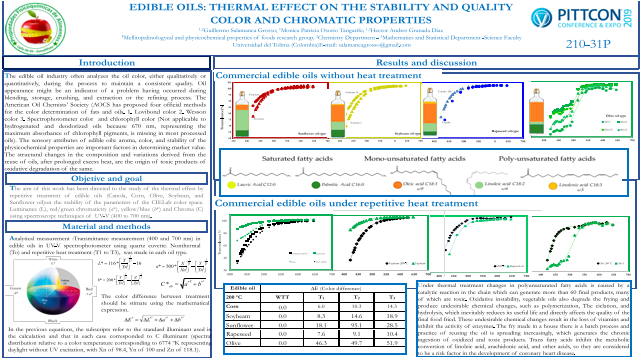 The aim of this work has been directed to the study of the thermal effect by repetitive treatment of edible oils (Canola, Corn, Olive, Soybean, and Sunflower oil)on the stability of the parameters of the CIELab color space. Luminance (L), red/green chromaticity (a*), yellow/blue (b*) and Chroma (C) using spectroscopy techniques of UV-V (400 to 700 nm).